The Hillcats will have everyone wearing pink on Friday, June 23rd at 6:30 p.m. with their 11th Annual "Swing For A Cure" Breast Cancer Awareness Night presented by Centra's Alan B. Pearson Regional Cancer Center! Proceeds from this event will benefit the Susan G. Komen For the Cure Foundation. The first 1,000 fans through the gates at 5:30 p.m. will receive a free pink commemorative t-shirt! All Hillcats players will don pink commemorative jerseys which will then be up for bid during a silent auction during the game. Fans will also have the chance to make a donation at the Box Office that night. It's estimated that there will be over 230,000 reported new cases of invasive breast cancer in the United States in 2017 and as many as 1 in 800 women in Virginia alone, may be diagnosed each year. The Susan G. Komen Foundation was created in 1982 by Komen's sister and has since raised $2.5 billion for research, treatments, and support for survivors. 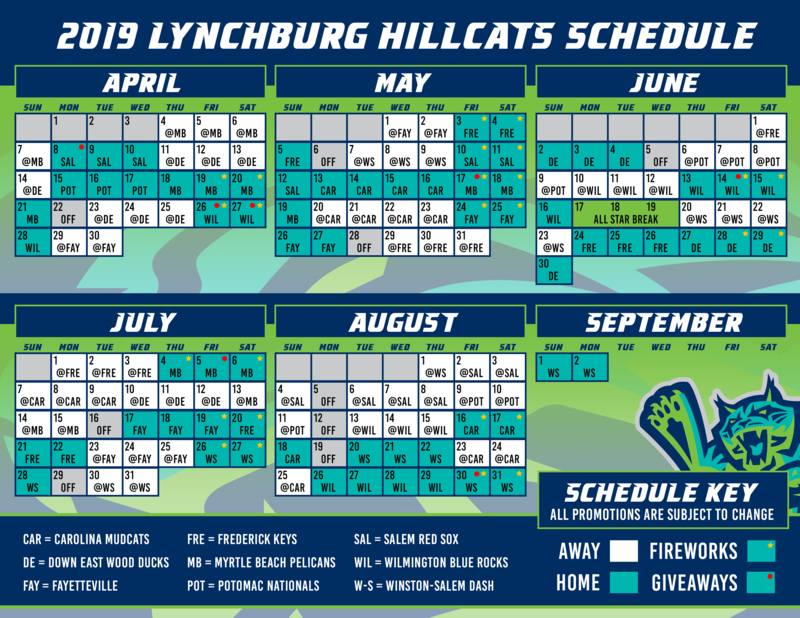 The Hillcats would like to thank the following sponsors of the Swing For A Cure for their support and donations: Centra Alan B. Pearson Regional Cancer Center as the title sponsor; ABC 13; Apple Ford of Lynchburg; Central Virginia Imaging; Central Virginia Oral and Facial Surgery; Dr. Kim Combs; Flowers Baking Company; Heartland Lynchburg; Hedges Insurance; High Peak Sportswear; Johnson Health Center; 105.5 KD Country; Lynchburg Gynecology; Medical Associates of Central Virginia; Pathology Consultants; Peery Family Dentistry; Physicians Treatment Center; Piedmont Community Health Plan; 97.9 FM The Planet / Oldies 103.9 & 106.9 FM / 93.7 KHF; Rob Bass, MD | Clinton Beverly, MD | John Guglielmetti, MD | Peter Ploch, MD; WIQO / ESPN Radio; WJJS / STEVE FM / WYYD; and Women's Health Services of Central Virginia.